This is the ID you will use to launch your Clock. One Time Clock User ID is included in your regular subscription fees. This means one Clock can be open at a time. Additional Clock ID's are $20/month. 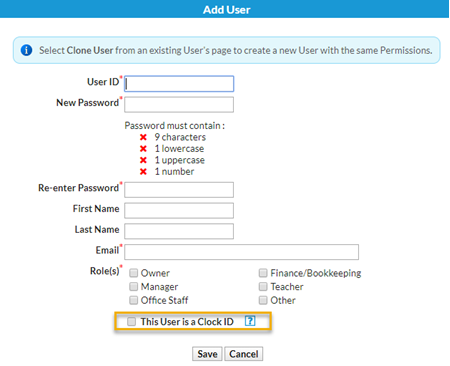 If you need additional Clock User IDs please use the Support button while logged into your database and let us know. See Multiple Clock Locations. A Time Clock User ID is different from a regular Jackrabbit Care User ID because it only allows the user to launch the clock. It cannot 'do' anything else in your database. A regular User ID cannot launch the clock. Point to Tools and select Manage Users & Permissions. Click the Add User Button. In the User ID field, name the Clock User ID. The ID must be unique throughout the entire Jackrabbit system. Suggestion: combine your school name and the word 'clock.' For example: mynameclock. Enter a password, etc. for your Clock User ID. Check the box for This User is a Clock ID.